Give your kids a chance to test their skills and explore their capabilities with our Easter Sunday festivities! 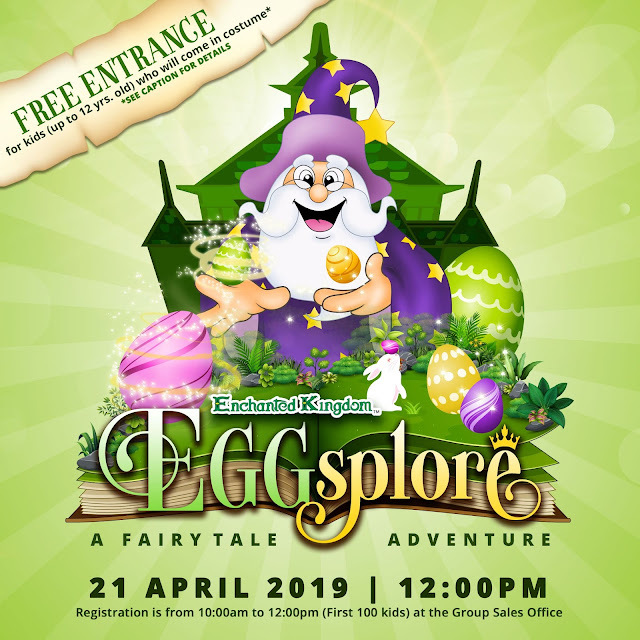 Enchanted Kingdom presents EGGsplore: A Fairytale Adventure, free entrance to all kids up to 12 years old all dressed up in Easter or Fairytale/Royalty inspired costumes—princess, wizard, or bunny, any is excellent as long as you work your ‘fit! Be one of the first 100 kids to register so you can participate in the shows and activities such as Easter Egg Hunt, Cenakulo Rock Kids, Chubby Bunny Challenge, Jazz Up Your Easter Egg, and Easter Costume Contest. Waste no time and head on to the Group Sales Office of Enchanted Kingdom in Santa Rosa to register from 10:00AM to 12:00NN on April 21, 2019 Sunday. Dress your best and you’ll be blessed! Plan your trip accordingly and make the most of Sunday’s Best! Visit www.enchantedkingdom.ph for updates.